Connected to the previous message; The detailing of the front, important design aspects have been added by Mile Knezevic together with Mirko. They have developed into faithful supporters of this project. I can rely on them to come up with solutions I hadn't thought about. As a team you can hear they are having fun working on the house. The combination with the old oak as basis for the white main cladding was Mile's idea. The view and building of a window on the west was Richards idea. The doors on the ground floor were given by Mirko. Stellagas in the supply room and workshop were given by the Auto Praonica (car workshop) of Vojnic. It has been decided a new door needs to be fitted in stead of the old front door. Actually it looks like a door, but it doesn't stop winter cold or summer heat. I am rather attached to the oldness of it though. The designing of the front door will be integrated with a small roof covering the small veranda around the door. It will be all one can do with natural wood. Quite crazy. Our house is getting a face. Strong lines, color combinations and a strong top. The cladding is a combination of 10 cm thick 80 year old oak and simple wood cladding. Insulation between the wall and the wood makes for comfortable climate summer and winter. Mile (again). As nothing is standard, time is running out for this project. I want to finish this in a simpler way. To be able to move into next steps. Moving into phase we earn money again and starting up new projects. 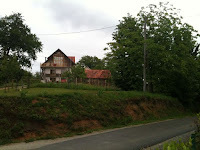 A foundation; Friends of the forest or 'prijetelji sa suma' will be started up to support the family of Mile to begin with. News about that in next messages. In the meantime we will design next steps, and execute beautiful new additions to the house.